Jesus clearly cared about healing people during his ministry on earth. Physical healing was (and still is) an outward sign of God's power through Jesus Christ -- a proclamation that Jesus is the Son of God. But more so than the physical healing, Jesus was more passionate about the healing of the eternal body - our souls. When someone is ill and recognizes a set of symptoms that he cannot control on his own, a physician is consulted for the diagnosis and course of treatment, and (hopefully) ultimately a cure for the disease. In the case of a chronic, long-term affliction, there is more than just the initial consultation. There are follow-up visits where progress is monitored and the course of treatment is adjusted where necessary. Eventually the patient is held accountable for maintenance of his restored health and sees the physician for periodic check-ups. Several years ago, I was living my normal life, unaware that I had anything wrong that required treatment by a physician. However, people around me noticed various symptoms and wondered - even speculated - things about my well-being. But it wasn't until someone who I trusted and respected came right out and told me that I couldn't fix these symptoms on my own, that I finally sought help, diagnosis, treatment, and am now in regular maintenance mode for a thyroid condition. While the symptoms and the condition are not in and of themselves fatal, if they had been left untreaed, there was the potential for some serious complications. It's the same with our souls. So many people are living their lives, unaware that there is anything wrong. Or, they may sense that there is something missing, but don't know how to describe the void. Or they believe that the void is supposed to be there, that it's a normal part of life. Some - most - try to fill that hole on their own, even though they know the emptiness will return. It's only when somehow the picture of their lives is revealed to them that they see that something is missing. And often it takes someone with a more complete picture of life to point them to the Physician who specializes in treating the soul. And that Great Physician is Jesus Christ. At the initial consultation, the diagnosis is made: You need forgiveness for your sins. Just as with any other illness, the patient can either accept or reject the diagnosis. 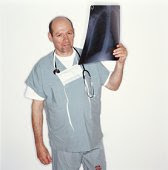 If rejected, the patient is free to go elsewhere for a second opinion that may be easier to accept. But the affliction - the need for forgiveness - remains. If the patient chooses to accept that he is a sinner in need of forgiveness, the treatment, restored well-being, maintenance, and ultimate cure begins. Jesus enters the diseased heart. The power of the Holy Spirit goes to work to produce results: love, joy, peace, patience, kindness, goodness, faithfulness, gentleness, and self-control. The patient is prescribed a maintenance regimen: daily Bible study, regular fellowship with other Christians, regular worship, continual prayer. The extent of the healing is seen by how we use the gifts that God has given us to use for the glory of His name. If he stays with the maintenance program, the void is filled more and more. If he falters and omits a part of the program, little by little, the hole starts to return. Returning to the Physician for treatment, adjustment, or a check-up is as simple as calling out in prayer or by asking a trusted fellow patient in recovery to point you back to the right direction. And yes, there will be ultimate healing of our diseased souls when we reach heaven, meet our Great Physician face to face, and hear the words, "Well done, good and faithful servant."